A city(bacteria) policeman, the first city was invaded to recognize the suspect'sface (the sequence of the virus); the second time the suspect was found, he wasfound looking for someone with a crRNA (crRNA) Use nucleases) to cut people(literally "cut"). The CRISPR-Cassystem is such a guardian! The end of lastcentury, genetic engineering began to rise, a variety of gene editingtechniques have been improved, such as zinc finger, TALENs. However, bothtechnologies have apparent limitations. For example, in Kaifeng dishes • Zincfingers and gold arches • TALENs, you can only buy hamburgers that have beenmatched (base sequence); but in Northern Shaanxi • CRISPR, you can customizethe burgers and enjoy how to mix sauces Can be. As early as1987, Yoshizumi Ishino, a Japanese microbiologist, unexpectedly found DNA fragmentsinterspersed with tandem repeats (5) at the time of sequencing of E. coli. Eachof the repeats contained a unique structure(difficult to understand for mostpeople）. But at thattime people did not know anything about this it. In the 1990s,researchers of different countries discovered this special sequence, which isuseless to ordinary people, in the genomes of various bacteria and archaea. In 2001, RuudJansen of the University of Utrecht in the Netherlands named the structureofficially, the CRISPR sequence. And he also found that many of the nucleasesassociated with it, collectively referred to as another familiar word - Cas,which identified the CRISPR-Cas system. In 2011, themolecular mechanism of the CRISPR-Cas system was revealed: when the virus wasfirst infected, the bacteria incorporated a sequence of foreign genes into itsown CRISPR; when it was second intruded, CRISPR transcribed a sequencecontaining both foreign and foreign The crRNA, which matches the sequence ofthe source gene, mediates nuclease binding and cleavage after crRNA recognizesthe virus and thus forms a self-protecting mechanism. In 2013,Jennifer A. Doudna and Jillian F. Banfield of the University of California,Berkeley, discovered that the CRISPR-Cas system efficiently edits genes. 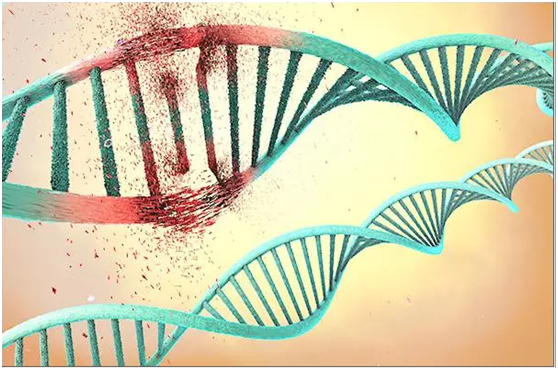 ThenChinese scientists Zhang Feng CRISPR-Cas system technology successfully appliedto mouse cells and human cells, and achieved gene editing. 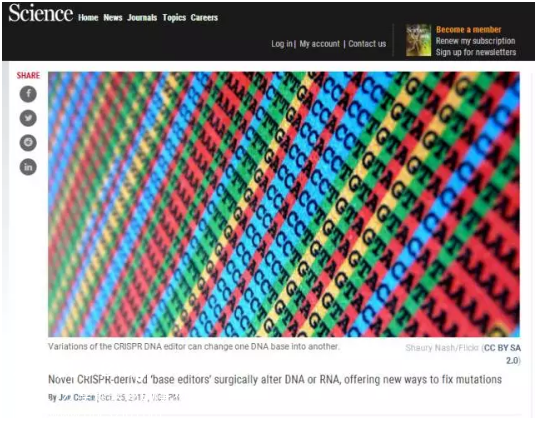 In October 2017,Professor Zhang Feng introduced a new CRISPR system called "REPAIR"in "Science"，which can effectively repair RNA and correct the wrong informationon RNA to synthesize the correct protein to treat the disease effect. It bringsnew hope for the treatment of Parkinson's disease and other research. In order to make CRISPR technology moreefficient, the transformation of CRISPR is also a hot topic. Gene editing, inaddition to its research in the laboratory, can also be put into practical use. 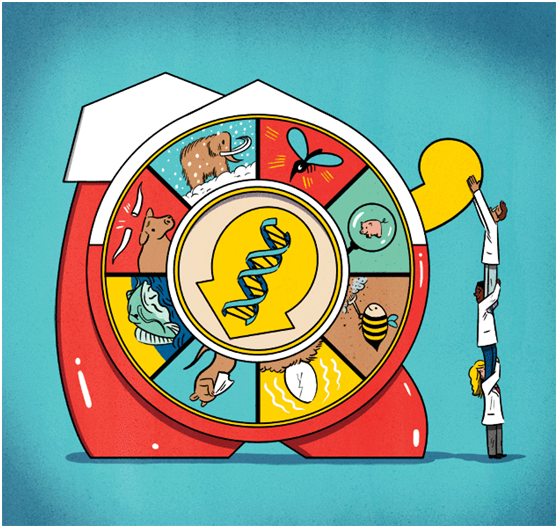 In addition toediting genes, the real power of the CRISPR-Cas system is to explore themechanisms of action of the genome so that we can better understand themolecular mechanisms of developmental metabolism to treat diseases and evenedit human embryos. Gene editingmakes the future full of possibilities! Disclaimer:"Cell State" WeChat platform reprinted and annotated information fromother sources, the purpose is to pass more information, does not mean that thisplatform agrees with their views or confirm the authenticity of its content,does not assume the infringement of such works Direct responsibility and jointand several liabilities. If infringement, please contact me to delete!